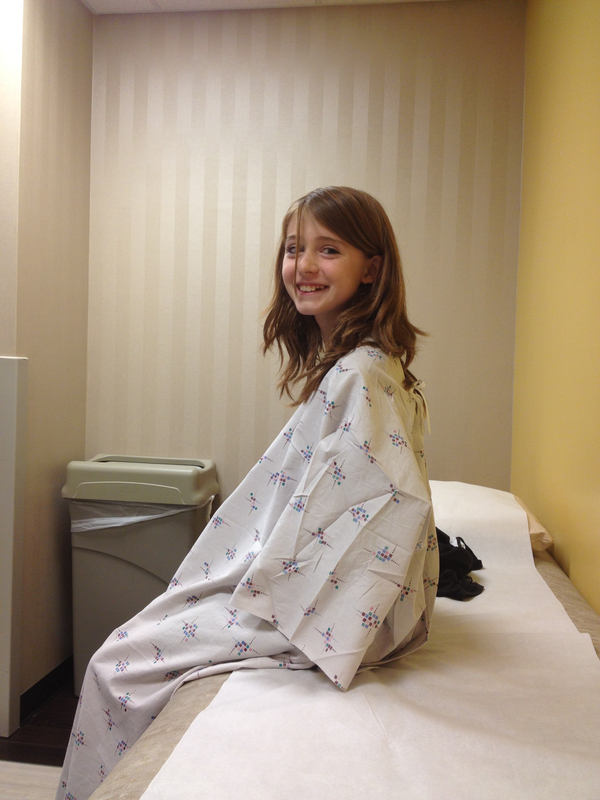 Today Mackenzie had her follow-up appointment with the orthopedic doctor. She weighs 68 lbs and was 4’10.5″ tall, which is 1″ inch taller than 6 months ago (and 2″ taller than a year ago). They took her x-ray like normal and brought her back to the room. The resident doctor came in and pulled up the x-rays on the screen. I immediately knew that the curve looked almost as bad as it did when we originally went to see the doctor the first time. He told us that it measured 49°, which is only 2° better than a year ago. He said that is just what we want to see – that the brace is keeping the curve from progressing for now. He said that they didn’t expect the brace to help improve it, just to hold it where it was. Then the doctor came in and looked her over. He mentioned that he knew the curve seemed better during the last visit (30°), but that just like people who have good picture days and bad picture days, the spine is the same way. So I guess Mackenzie’s spine was having a “good” day that day in February. I asked him what they would do if the brace kept her curve at the same degree until she finished growing. He said that since she is on the borderline of needing to have surgery then that would really be up to us. He said that since she is so young with such a severe curve, that it was most likely going to get worse as she grew and would most likely require surgery. He said that she would wear the brace until she stops growing, which is usually around 15-16, but that would vary based on her. He said that the lowest curve he has operated on was 45°, but that was a patient he had for 5 years (age 13-18) and she just wanted it fixed after all that time. He said he usually operates when the curves get closer to 60°. Even though brace is just keeping her straight at night, he said that when she eventually does have surgery that it would help with the form of her back. He said that since her curve is a natural curve that it shouldn’t cause her problems later on in life and that it shouldn’t get worse as she gets older. He did mention though that the larger curves in children this young are the ones that do get worse faster. I’ve been through these appointments, and had scoliosis surgery when i was twelve. I’m glad I did it because my curve was bad. I don’t remember what it was, but there were two of them. After the surgery i grew two inches! Hope she does not need surgery and that the brace does the trick. Thanks! I hope not either, but it doesn’t sound too hopeful. Do you remember how the recovery was from the surgery? I’m sure she would grow at least an inch or so if/whenever she has it! I was in the hospital for five days. Then at home it took another few weeks, or maybe a month to be walking around and feeling like my old self. I had to be careful to avoid lots of physical activity for six months or a year…I can’t remember. It was about twenty years ago, so I’m sure they have different methods that allow for quicker recovery times. I did get out of PE for awhile, which was great since I got to miss the square dancing unit. Good luck to you guys. I will keep reading for updates. Praying the brace helps more and more! I thought you were going to say “this is one yr. after her surgery”. Just a brace, I would think they would do the operations since she is young and hopefully very healthy. I’m 56 and will be having the operation, I’m at a 61 degree curve. They wanted me in a body cast when I was younger, but felt it was not necessary. 3 kids later and I was still ok. Was now 49 degree. Now is my time. Not later. It’s now all about quality of life for me. No wheelchair for this girl. I hope your daughter is doing well. I keep my daughter very monitored also. She is now 23 and shows no signs. The only reason they are holding out is because they want her to grow as much as she can before doing any kind of spinal fusion, because it will prevent her from growing much further. They’re trying to make it past her big growth spurt without the curve getting much worse. They said since she was so young with a bad curve that there is a good chance it will get worse as she gets older, but we’ll just have to wait and see. I wish you good luck with your operation! I thought I would throw in my two cents when it comes to fusions. 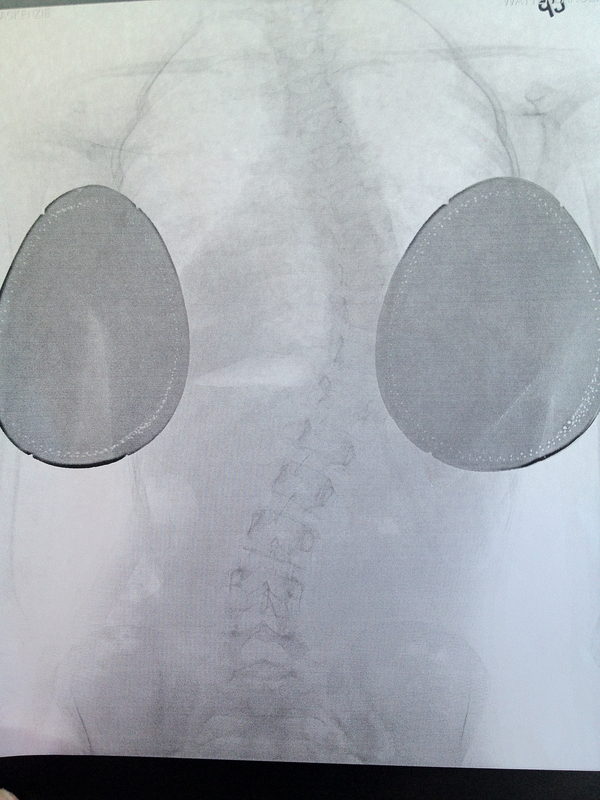 I have had two spinal fusion surgeries in the last two years, the last one was in September 2012. It isn’t an easy road but when I looked at what I was missing out on because of my back (I didn’t have scoliosis but had spinal stenosis, spondolyothesis, and two herniated discs pressing on three nerves – my left S1 was dying and I was losing the use of my left leg when I finally went for surgery) and imagined what could be missing in the future and it made me at peace with my choice. I had two levels done, which is incredibly mild compared to what they usually have to fuse for scoliosis. The recovery is the same, but I imagine the physio is a lot more intense the more levels they fuse. After the first surgery failed I had a very dark time where I lost hope. I am just getting back to physio five months after the second operation and, somehow, have found a new hope reserve, maybe I can pull out of this? Anyway I guess I just wanted to give you a perspective of soemone who had the surgery. I will never tell anyone it is easy – it is not. And I can’t comment on if it was worthwhile or now, but I have to think it will be, when this three year journey through the darkness brings me back into the light. Good luck, and if you have any questions, or your daughter wants to talk about what surgery is like closer to the decision time, feel free to contact me. Hi! Thanks so much for commenting and telling me the experience from your side. We have her next checkup in less than two weeks and I’m scared that the curve will be worse, judging from what I can see. If it is worse, I don’t know what the doctor will do – I guess it just depends on where the curve is. Mackenzie says she wants to have the surgery but that is only because she knows she will get attention (gifts, cards, etc.) and doesn’t really have a clue what it’s like to really be in pain. Whatever happens I just hope it’s the right choice for her, but I don’t know what the right choice is yet. If she doesn’t have the surgery I don’t want it to interfere with her life later or cause more problems but if she does I just hope nothing goes wrong. Everyone I’ve talked to and read about don’t regret doing the surgery at all, even with all the pain. I hope that is what you are saying later on, too! Good luck with your recovery!